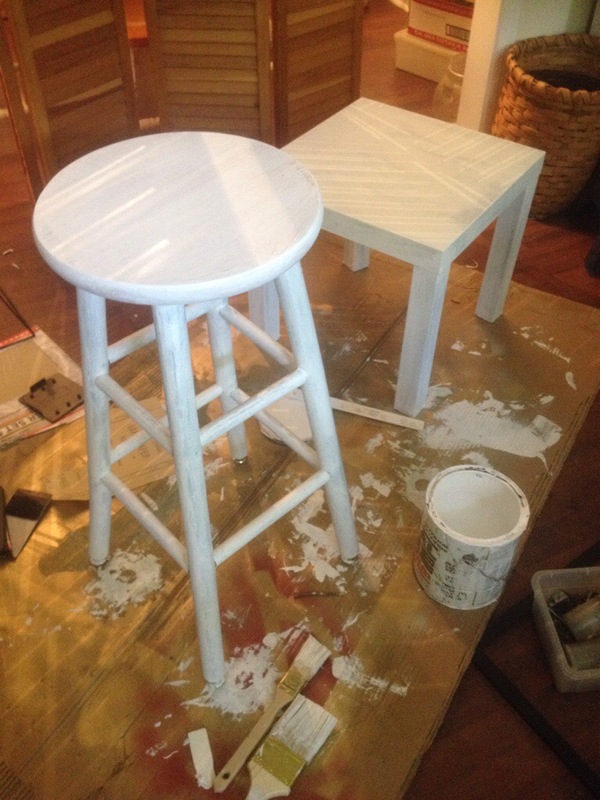 You may remember the barstool I primed last week along with my Ikea Lack Lookalike table. I finished her today and I think she’s beautiful. Well what do you think? I’m actually gonna use it as a side/drink table in the Lounge. 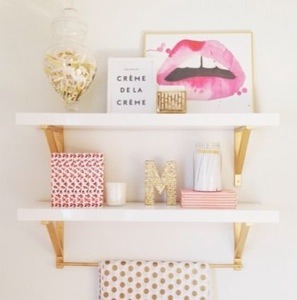 I can’t wait til I am finished with the room and can show you the reveal!! Here it is again, before and after. I know it’s hard to tell in the picture but the seat is gold, the legs light pink with gold again at the bottom. 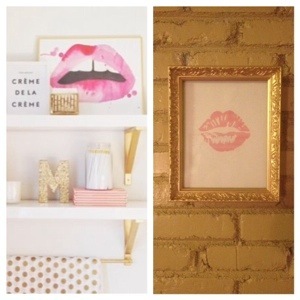 I’m loving the whole “gold dip” movement. Speaking of awful pictures, my pictures are just that, AWFUL. I’m using the camera on my iPhone and it’s just not cutting it. I also think I need to take advantage of the internet and research how to stage my stuff for great pictures. Does anyone have any suggestions on some sites or blogs I should look at? I made it back, aren’t you proud of me? During the break, lol, I planned on working on the appearance of my blog. 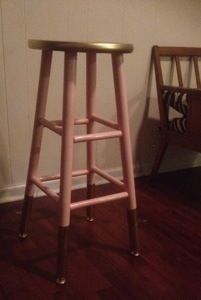 Unfortunately I got sidetracked ( as usual ) and began working on my Ikea Lack side table lookalike. 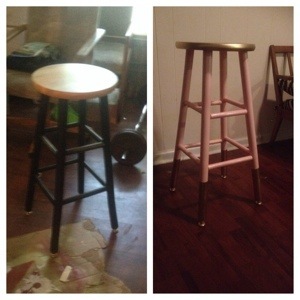 Today I primed it along with a bar stool I had sitting around. 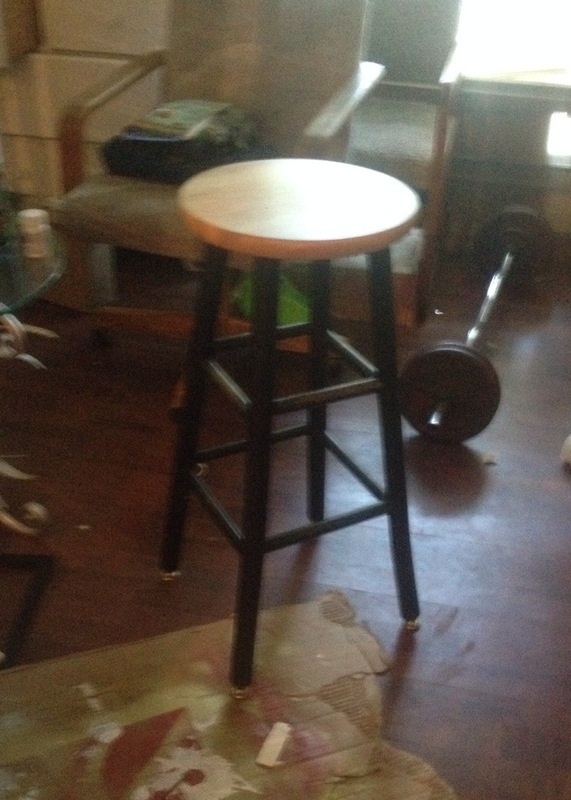 I did not take a before pic of the table but here’s a before of the stool. Here it is primed and sorting besides the primed side table. You can see how my table looks almost exactly like the Ikea Lack Side Table. I will wait for them to dry overnight then I will sand both of them a little to try and remove the brush strokes before I spray paint them (next time I will def. use foam rollers and brushes). I am still working on the “Teenage Lounge”. Today I hooked up my new printer/fax/copier and decided to fill an empty frame on the wall with a littlre art, courtesy of Google Images. This is a picture from my inspiration board for the Lounge. What cha think? Here they are side by side. 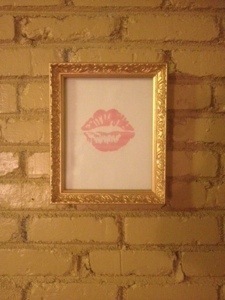 The inspiration picture makes me want to paint my walls white. Leave a comment and tell me what ya think.